Seven miles east of the Oklahoma and Texas border, the town of Erick sits on the edge of the high plains of the Panhandle surrounded by arid countryside. Built to support vacationers and other automobile travelers along Route 66 in 1948, the West Wind Motel’s white stucco buildings with red mansard roofs created a bright presence in Erick. The motel was in a good location to capture the business of travelers on Route 66. Platted in 1901, Erick initially served as a regional agricultural center. Gas production from a nearby field supported the economy as well. Fine old brick buildings from the town’s first several decades remain in its historic downtown. Erick sat on the edge of the Dust Bowl, however, and agricultural depression hit the little town hard during the 1920s and 1930s. Many residents moved to California and elsewhere. World War II brought rejuvenation. By the end of the war, travelers flooded Erick’s Broadway Street, the local Route 66 alignment. The Chamber of Commerce printed a circular proclaiming Erick “not a war spoiled town or just another boom town but a town with a half century of service,” and declared it "the first town you encounter, going west, which has any of the true western look, with its wide, sun-baked streets, frequent horsemen, occasional side-walk awnings, and similar touches." It was into this appealing business climate that the West Wind Motel was born. 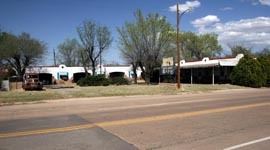 Five blocks west of the town’s main intersection, the West Winds Motel occupied the north side of Route 66, a location with the commercial advantage of visibility for the westbound traveler. A neon sign flashed the name of the motel beneath a painting of a bucking bronco. Faded today, the sign with its head-down-heels-up horse and his tenacious rider is still visible. Motor courts like the West Winds Motel generally consisted of individual guest cottages or multiple-unit guest buildings with continuous facades, often with attached garages; an office and owner-residence building; and perhaps a coffee house; arranged around a central open space. At the West Winds, an office and two multi-unit buildings set at right angles form the courtyard. A gravel loop once outlined the U-shaped central public space, giving the motel two street entrances. Until 2002, a rusting children’s swing set, evidence of the prosperous post-war years when families stayed at the West Winds, still stood windblown and creaking in the courtyard. Particularly significant are the motel’s design accommodations for automobiles. Its location alongside the highway and some distance from the town center made automobile access easy. The architectural design also caters to drivers and riders. 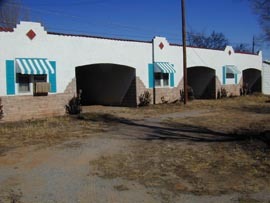 The northern building has four motel units separated by open garage bays, which provide the only entrance to the rooms. In lieu of garages, the eastern building features a canopy that stretches along its front, its wide metal band wrapping around the corners like an automobile grill. As lodging people became more profitable than lodging automobiles, new motor courts generally left off the garages, and owners of older courts filled in garage bays like those remaining in the West Winds. Their survival here makes the motel unusual and closely ties it to the decade of the 1940s when private automobiles transitioned from novel and highly valued possessions to common modes of transportation. The West Wind’s stone-and-stucco construction, linear buildings, courtyard, and Mission style invoke a Spanish hacienda. The motel’s name ties it to a time in history when the West had captured the imagination of much of the United States. Because of its historic significance, the National Park Service listed the motel in the National Register of Historic Places in 2004. The West Winds Motel is at 623 Roger Miller Blvd. in Erick, OK, and is now used as a private residence. Its National Register nomination form can be found here.